The Portland Development Commission (PDC) is managing the renovation of the historic gazebo. Renovation requires lifting the 120 year old dome off the structure, storing it during construction, and hoisting it back on to a new support structure. While the dome is down, it will be repainted and weatherized. Structure improvements include replacing old wood columns, extending the roof line, raising the dome to improve its visibility and add natural light, and adding electrical outlets to the structure. 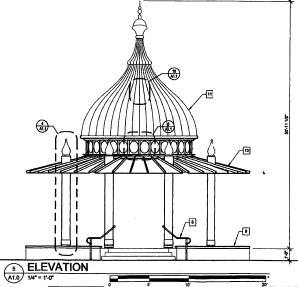 The gazebo was added to the park in 1978 to showcase the architectural landmark cupola (dome) salvaged from the Hill Block Building before it was torn down in the late 1960’s. The Hill Block Building, built in the late 1890’s, was located at the intersection of N. Russell Street and N. Williams Avenue, once the heart of the former city of Albina. Built by Charles H. Hill, the first mayor of the city of Albina (1887-1892), it originally housed a drug store, two additional stores, and a bowling alley. The building was demolished for a planned expansion of Emanual hospital that never happened. The land still sits vacant nearly 40 years later. The Hill Block Building was an informal gathering spot for the neighborhood and community. The dome represents an important piece of Portland’s immigrant and African American community history. It is a reminder of the once thriving commercial district that has been lost due to construction of I-5 and Emanual Hospital along with other “revitalization” projects. Preservation of historic and culturally significant objects is a high priority of the Interstate Corridor Urban Renewal Area (ICURA). “PDC is committed to the preservation of the gazebo and its history in this neighborhood,” said Susan Kuhn, PDC Project Manager. The PDC project is being undertaken in cooperation with Portland Parks and Recreation. Management and funding will be done through PDC using ICURA urban renewal funds. The southeast corner of the park around the gazebo will be closed with security fencing during construction. Project design is by Robertson Merryman Barnes Architects and the general contractor is InLine Commercial Construction. During construction the key project contact is Dave Obern, PDC Construction Service Manager, 503-823-6206. For general ICURA information contact Susan Kuhn, 503-823-3406. More information about the Dawson Park renovation can be found at http://www.pdc.us/ura/interstate/dawson_park.asp.